Balmoral Releases Initial Resource … | Balmoral Resources Ltd.
(Vancouver, March 7, 2016) Balmoral Resources Ltd. (“Balmoral” or the “Company”) (TSX: BAR; OTCQX: BALMF) today reported the initial resource estimate for the Company’s Grasset Ni-Cu-Co-PGE deposit. The Grasset deposit is located on the Company’s wholly owned and royalty free Grasset Property, part of the Detour Trend Project in West-Central Quebec. The Grasset deposit is comprised of the sub-parallel H3 and H1 zones. The H3 zone has been intersected from the bedrock surface to a depth of approximately 550 vertical metres and remains open below that level for further expansion. The H1 zone, targeted by considerably less drilling to date, has been intersected for over 1,000 metres along strike and to a vertical depth of 450 metres. It remains open along strike to the northwest and to depth across its entire strike length. The initial independent resource estimate for the Grasset deposit has been prepared by Mr. Pierre-Luc Richard (P.Geo., M.Sc.) and Mr. Carl Pelletier (P.Geo., B.Sc.) of InnovExplo Inc. and is summarized below. Mr. Richard and Mr. Pelletier are independent Qualified Persons pursuant to NI 43-101. The current mineral resource estimate is based on results from 111 diamond drill holes (39,999metres) completed by the Company since 2014. As indicated below, the base case current resource is reported above a 1.00% NiEq* cutoff grade after incorporation of estimates for mining recoveries, mining dilution, milling recoveries, smelting and refining charges and certain penalties, as well as estimated operating costs based on those associated with mines currently operating in the local region. 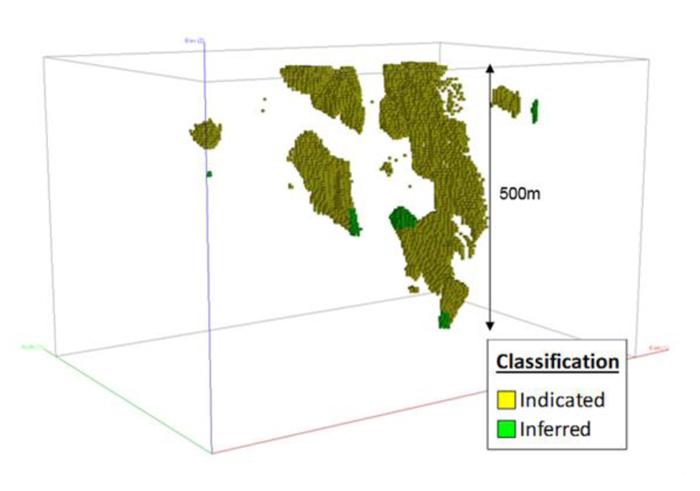 Figures 1 and 2 (below) show the grade shell block model and the location of the Indicated and Inferred Resources contained in the base case estimate. The majority of the Resources are contained within the steeply plunging core of the H3 zone from surface to a vertical depth of approximately 550 metres. This core zone remains open to depth for potential expansion. Two additional lenses are separated from the main body by localized zones of deformation. More closely spaced drilling in this areas would have the potential to increase the size of the two secondary bodies. Tables 2a and 2b (below) provide an analysis of the volumetric resources at a range of cut-off grades for the combined H3 and H1 zones as calculated by the Qualified Persons. The Base Case Current Resource (>1.00% NiEq* cut-off) is highlighted for comparison. While the results are presented undiluted and in situ, the reported mineral resources are considered to have reasonable prospects for eventual economic extraction. The estimate includes two (2) mineralized zones (Horizon 1 and Horizon 3). Resources were compiled at NiEq cut-off grades of 0.30%, 0.40%, 0.50%, 0.60%, 0.70%, 0.80%, 0.90%, 1.00%, 1.10%, 1.20%, 1.30%, 1.40%, 1.50%, and 2.00%. The base case resource potential is reported at a 1.00% NiEq cut-off grade. Cut-off calculations used: CAD 48.00$ Mining, 6.00$ Maintenance, 10.00$ G&A, 22.00$ Milling for a total of 86.00$ operating costs. A mining dilution factor of 7.5% was also applied to the cut-off grade calculation. *NiEq = [[(NiGrade(%) x NiCR(%) x NiPayable(%) x NiPrice($)) + (CuGrade(%) x CuCR(%) x CuPayable(%) x CuPrice($)) + (CoGrade(%) x CoCR(%) x CoPayable(%) x CoPrice($))] x 2205 + [(PtGrade(g/t) x PtCR(%) x PtPayable(%) x PtPrice($)) + (PdGrade(g/t) x PdCR(%) x PdPayable(%) x PdPrice($))] / 31.1035 - CrPenalty($)] / (NiPayable(%) x NiCR(%) x NiPrice($) x 2205); where CR(%) is a variable concentrate recovery ratio derived from metallurgical balance study, and Payable(%) is applied on concentrates. Note that a minimum deduction of 0.20% Co was applied on concentrate. Cut-off and NiEq calculations would have to be re-evaluated in light of future prevailing market conditions (metal prices, exchange rate, smelting terms, and mining costs). Density values were estimated for all lithological units from measured samples. 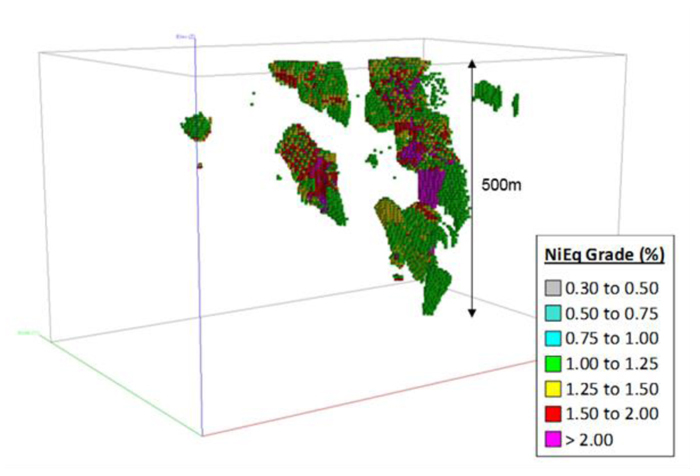 Density values for the Horizon 1 and Horizon 3 mineralized zones were interpolated from both a measured density database and a correlation database accounting for a selection of metals (Ni, Fe, Co) yielding the best correlation with the measured database. The resource was estimated using GEMS 6.7. The estimate is based on 111 diamond drill holes (39,999.43 m). A minimum true thickness of 3.0 m was applied, using the grade of the adjacent material when assayed, or a value of zero when not assayed. High grade capping was done on raw assay data and established on a per zone basis for Nickel (15.00%), Copper (5.00%), Platinum (5.00g/t), and Palladium (8.00g/t). Capping grade selection is supported by statistical analysis. Compositing was done on drill hole sections falling within the mineralized zones (composite = 1.0 m). Resources were evaluated from drill holes using a 3-pass ID2 interpolation method in a block model (block size = 5 x 5 x 5 m). The Mineral Resources presented herein are categorized as Indicated and Inferred based on drill spacing, geological and grade continuity. Based on the nature of the mineralization, a maximum distance to the closest composite of 50 m was used for indicated Resources. The average distance to the nearest composite is 22.9 m for the Indicated resources and 53.6 m for the Inferred resources. Ounce (troy) = metric tonnes x grade / 31.10348. Calculations used metric units (metres, tonnes and g/t). Metal contents are presented in ounces and pounds. The quantity and grade of reported Inferred resources in this Mineral Resource Estimate are uncertain in nature and there has been insufficient exploration to define these Inferred resources as Indicated or Measured, and it is uncertain if further exploration will result in upgrading them to these categories. The Qualified Persons are not aware of any known environmental, permitting, legal, title-related, taxation, socio-political or marketing issues, or any other relevant issue, that could materially affect the Mineral Resource Estimate. The Independent and Qualified Persons for the Mineral Resource Estimate, as defined by NI 43-101, are Mr. Pierre-Luc Richard, P.Geo., M.Sc. and Mr. Carl Pelletier, P.Geo., M.Sc. of InnovExplo Inc. They confirm that they have reviewed this press release and that the scientific and technical information is consistent. The Qualified Persons will prepare and deliver to Balmoral a technical report in support of this initial resource estimate. Balmoral will, in accordance with National Instrument 43-101, file the report on SEDAR (www.sedar.com) within 45 days of this release. The Company will provide notification once the report has been filed. Balmoral is a well-funded, Canadian-based company currently focused on the delineation of its high-grade gold discoveries, and on the further expansion of the Grasset nickel-copper-cobalt-PGE deposit on its wholly owned, 700 square kilometre Detour Trend Project in Quebec, Canada. Employing an award winning exploration team, Balmoral has a philosophy of creating value through the drill bit. By focusing our efforts in proven productive precious/base metal belts in one of the world’s pre-eminent mining jurisdictions, Balmoral is following an established formula with a goal of maximizing shareholder value through discovery and definition of high-grade, Canadian gold and base metal assets. This press release contains forward-looking statements and forward-looking information (collectively, “forward looking statements”) within the meaning of applicable Canadian and United States securities laws. All statements, other than statements of historical fact, included herein, including statements regarding the economic, metallurgical, mining price/cost estimated here in, potential for any future mining at or production from the companies properties, longer term fluctuations in metal prices, potential for future expansion or further delineation of the H1 and H3 deposits, anticipated exploration programs and expenditures, the discovery and delineation of mineral deposits/resources/reserves, the ability of the Company to expand the stated resource through future exploration and drilling, the timing of the receipt of assay results and resource estimates, the prospective nature of the Company’s land holdings, the potential future viability of the project and assets under discussion, the nature and style of the mineralization discussed and its interpreted continuity, interest of investors in the results generated by the Company’s exploration activities and business and financing plans and trends, are forward-looking statements. Forward-looking statements are typically identified by words such as: believe, expect, anticipate, intend, estimate, postulate and similar expressions or are those which, by their nature, refer to future events. Although the Company believes that such statements are reasonable, there can be no assurance that such statements will prove to be accurate, and actual results and future events could differ materially from those anticipated in such statements. The Company cautions investors that any forward-looking statements by the Company are not guarantees of future performance, and that actual results may differ materially from those in forward-looking statements. Important factors that could cause actual events and results to differ materially from the Company’s expectations include those related to weather, equipment and staff availability; performance of third parties; risks related to the exploration stage of the Company’s projects; market fluctuations in prices for securities of exploration stage companies and in commodity prices; and uncertainties about the availability of additional financing; risks related to the Company’s ability to identify one or more economic deposits on the properties, and variations in the nature, quality and quantity of any mineral deposits that may be located on the properties; risks related to the uncertain nature and interpretation of geological and geophysical models, risks related to the Company’s ability to obtain any necessary permits, consents or authorizations required for its activities on the properties; and risks related to the Company’s ability to produce minerals from the properties successfully or profitably. Trading in the securities of the Company should be considered highly speculative. All of the Company’s public disclosure filings may be accessed via www.sedar.com and readers are urged to review these materials, including the latest technical reports filed with respect to the Company’s mineral properties.